Limited provisions of the Poultry Product Inspection Act (PPIA) apply to poultry growers who slaughter no more than 1,000 poultry in a calendar year for use as human food. A person may slaughter and process poultry that he or she raised on his or her premises and they may distribute such poultry without mandatory inspection when the following five criteria are met [PPIA Section 464(c)(4) “Section 15 (c)(4)”4; Title 9 CFR §381.10(c)]. 5. The poultry products do not move in commerce. (In this context, “commerce” is defined as the exchange or transportation of poultry products between States, U.S. territories (Guam, Virgin Island of the United States, and American Samoa), and the District of Columbia) [PPIA Section 453; Title 9CFR §381.1(b)]. If any of the five criteria are not met, the owner of the poultry is not eligible for this exemption. Records necessary for the effective enforcement of the Act include slaughter records and records covering the sales of poultry products to customers. USDA/FSIS or State employees review such records to determine compliance with the requirement of the sale of no more than 1,000 poultry in a calendar year.1 See Appendices A and B in this Guide for sample logs. The Act does not exempt any person slaughtering or processing poultry from the provisions requiring the manufacturing of poultry products that are not adulterated and not misbranded. Thus, all businesses slaughtering or processing poultry for use as human food, including exempt operations, must produce poultry product that is not adulterated or misbranded.2 This exemption is one of the most important for small-scale poultry farmers. It permits a poultry raiser to slaughter and process their own birds on their own premises for marketing within their state as human food without federal inspection as long as the number of birds does not exceed 1000 chickens (or equivalent) within one calendar year. For the purpose of this exemption, one turkey is equivalent to four chickens. This specific exemption restricts where and how this processed poultry can be marketed and has specific labeling requirements. This exemption is per “farm” and not per farmer. If a number of farmers or family members operate on a given location known as “a farm”, only 1000 birds in total are allowed from this farm for the exemption. Each farmer or family member raising birds on a particular farm is not entitled to the 1000 bird exemption. If any farm is found to produce more than 1,000 chicken or 250 turkeys (one turkey equals 4 chickens for this exemption) it is a violation of the exemption. In these cases, either a NYS Article 5-A License for the processing facility or USDA inspection will be required. Both state and federal officials require that poultry product entering interstate commerce must be inspected and passed. Poultry slaughtered and processed under the 1,000 bird exemption is not inspected by NYSDAM or USDA therefore these products cannot cross state lines. The farmer must keep flock records, slaughter records and sales records of poultry products sold to customers (i.e., sale receipts) to verify that they are staying under the 1000 bird limit. The poultry raiser can only process poultry that they have raised. They cannot buy or sell any poultry products other than those from poultry of their own raising. All the slaughter and processing must be done on farm. The equipment used may be owned, rented or provided in the form of a Mobile Poultry Processing Unit (MPPU). Common Name: Chicken, Duck Geese, Turkey – Fresh or frozen, whole or parts, raw poultry. As of May 2012, parts from the same slaughter/processing batch can be grouped for sale, i.e. a bag of wings. How Sold: Fresh or frozen. If fresh, product must be picked up within 4 hours of slaughter by consumer or held at less than 41° F for no more than four days. Uses: Ready to cook carcasses/parts. All packaging materials in direct contact with food must be safe for their intended use under the Federal Food, Drug, and Cosmetic Act (FFDCA). 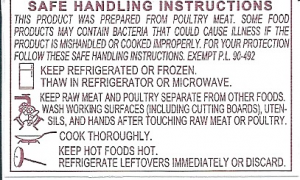 Poultry products may not be packaged in a container that is composed of any substances that may adulterate the contents or be injurious to health. Only FDA approved food grade packaging is allowed. It is the farmer‘s responsibility to see that approved food-grade packing materials are used. Proper wrapping and rapid freezing contribute to a longer lasting quality product. The goal is to prevent moisture loss from the meat (freezer burn) and keep air out. Packaging options for poultry include: freezer paper, tray wraps, plastic wraps, barrier films and meat trays, and heat-shrink bags that are not vacuumed. Cryovac packaging (also known as reduced oxygen packaging or vacuumed sealing), is not allowed under this processing exemption. New York State has adopted the USDA FSIS Mandatory Labeling Requirements. The following items are required to be on the principal display panel (the main label) for all sales of meat or poultry, or meat or poultry products sold in New York. • Inspection legend and establishment number- For poultry processed under the 1000 bird exemption, this does not need to be stated as the farm or product is not inspected. The label must include the statement: Exempted — P.L. 90-492. .• Net weight statement- This includes packed on date, sell by date, price per pound, and net weight. Frozen meat does not require a sell-by date. Products can be sold by the package or by the pound. If sold by the pound the net weight must be on the package and the price per pound price must be posted for all consumers to see. Digital scales suitable for commerce are required for sale by the pound. The Department of Weights and Measures will need to certify the scales used in the business. Scales are sealed and a sticker is adhered showing their expiration date. A small fee is charged for the inspection. • Address line- This must include the name and address of the farm. 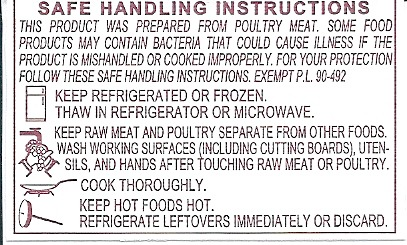 • Handling statement- FSIS expects all poultry sold in commerce to bear safe handing instructions. Producers operating under the 1000 bird exemption must use a modified safe handling instructions label that denotes processed under Exempt P.L. 90-492. Nutrition facts are not essential for raw (fresh or frozen) poultry. However, if a farmer makes a nutritional claim in any way, then s/he must provide a nutritional label. All water used in processing, cleaning and sanitation, in chilling tanks and ice manufacture, and in any other aspects of the production of whole raw poultry carcasses shall be potable. Private water supply shall be tested annually to determine potability. Approved sanitizing agents (soaps and detergents) for use on food contact surfaces must be used in prescribed concentrations and methods. The on farm processing of poultry whether utilizing MPPU or farm owned equipment must be managed in a manner that protects the environment, including surface and groundwater, and soils.